PLEASE SCROLL DOWN TOWARDS THE END FOR AN UPDATED POST OF THIS RECIPE. 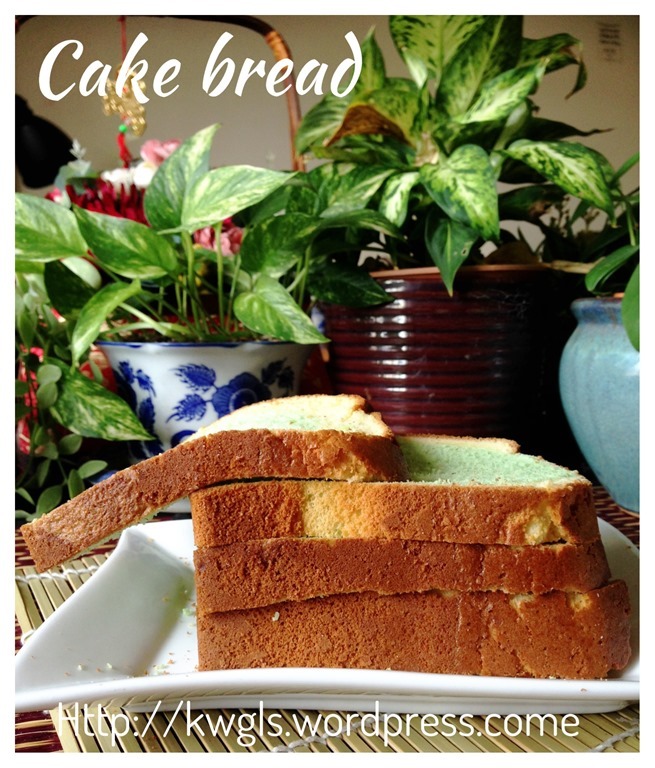 It is bread surrounded by a cake…Rather confusing. A bread dough was placed in the loaf tin, prior to the baking of the bread, some cake batter was poured on top of the bread and baked together. At the end of the day, a loaf of cake surrounded bread was produced. 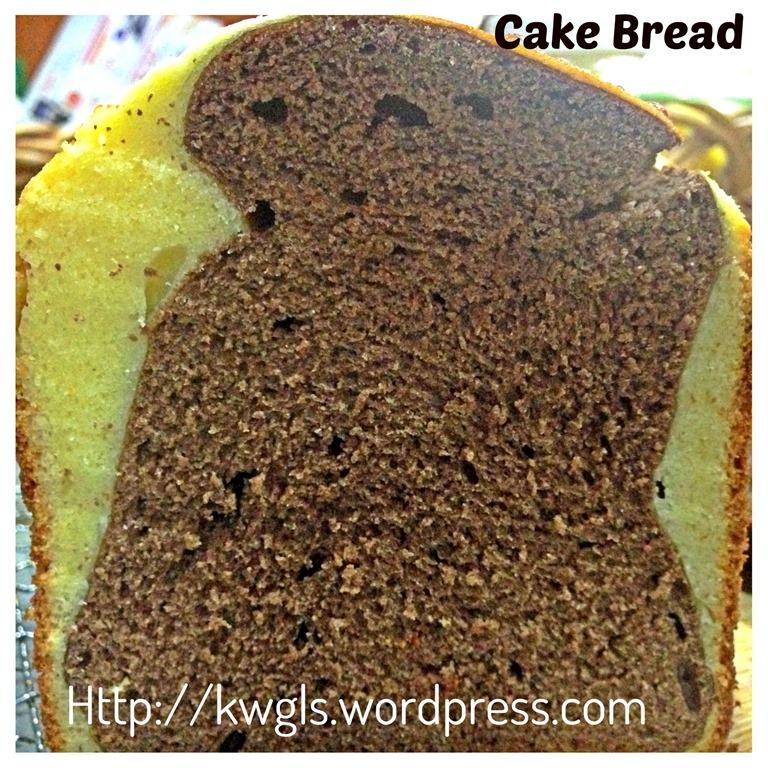 The texture of the cake is very soft and blends well with the fully proofed bread. 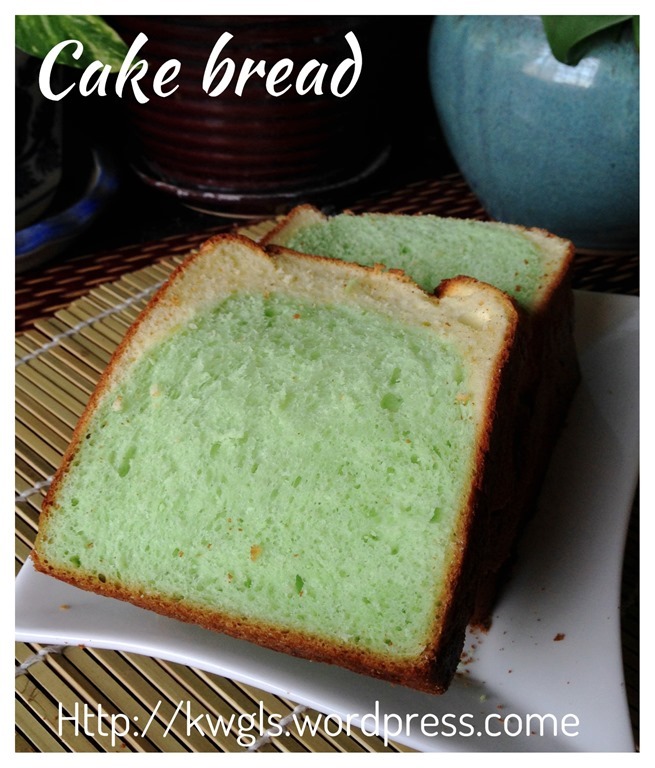 I have obtained this recipe from Ms Adeline Sim from my Facebook Group – Food bloggers and Foodies United. She had disclosed her recipe in her post and I have decided to try it out. 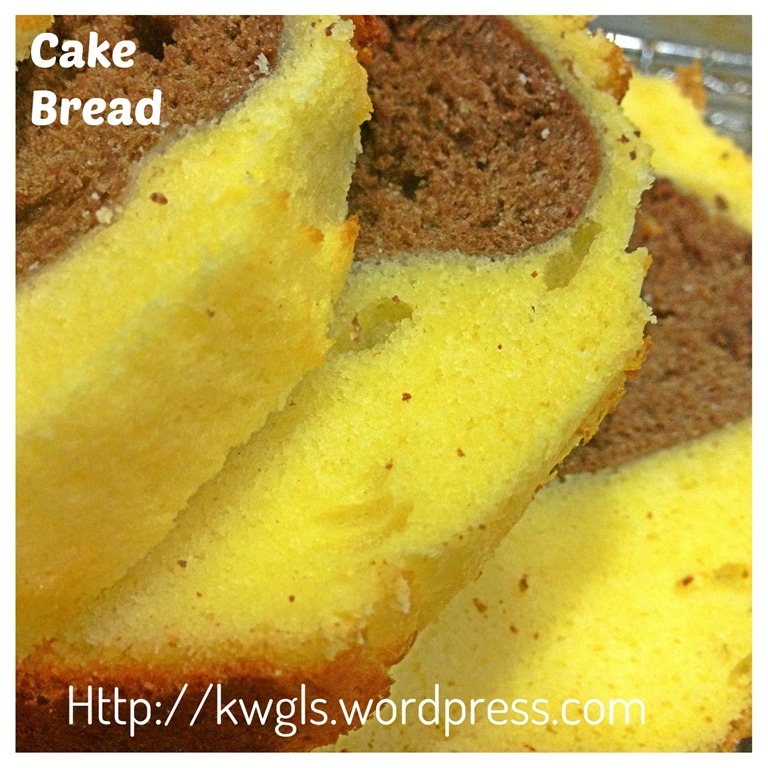 In fact it this bake item is quite common in Singaporean and Malaysian bakeries. As I do not have her required mould of 450 grams, I have used a standard loaf Pullman tin 9”x4”x5” for the cake bread. Half way while I was preparing, I found that my cake batter was inadequate to cover the whole loaf. Therefore, in this recipe, I will increase the egg batter from 4 eggs (as in the illustration ) to 6 eggs. 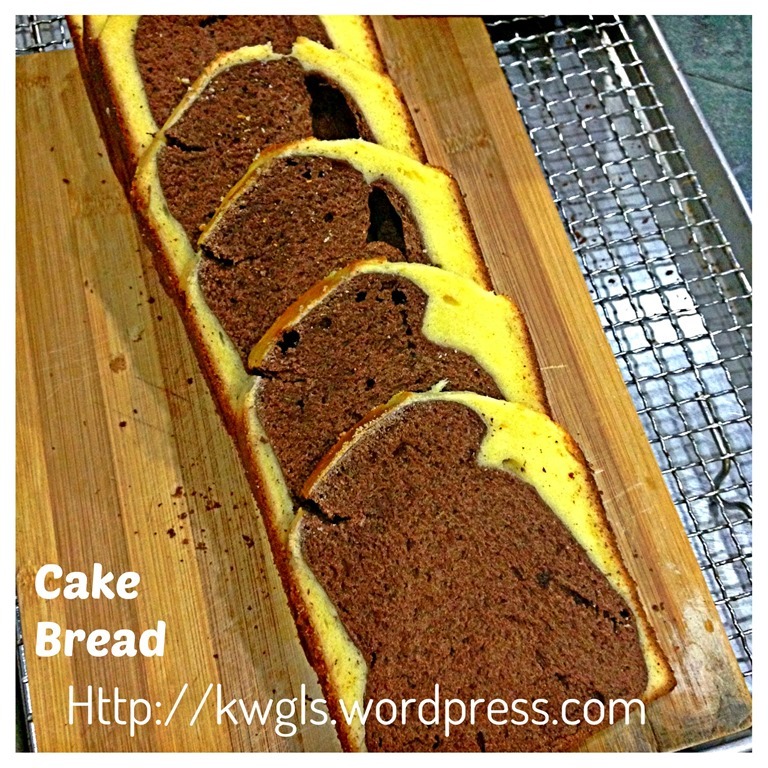 With this portion, reader’s final cake bread will have more cake portion than what is illustrated here. I should not say that the preparation is easy. It is definitely quite laborious but it will pays off when you take the first bite. 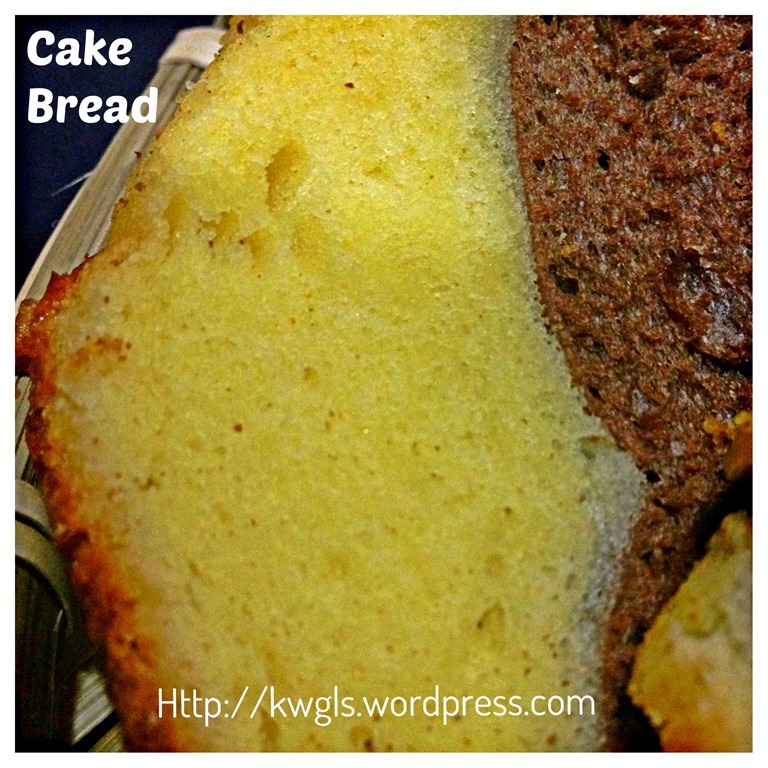 The recipe yields both cake and bread of almost the same texture. Soft, fine and is definitely a good breakfast item to go with a cup of tea or coffee. Whether or not to go with jam is up to individual, but I prefer to dip in my cup of coffee. * Note that cake portion have been adjusted to 6 eggs instead of 4 eggs as in the illustration. Lightly greased the Pullman tin using some cooking oil or butter. 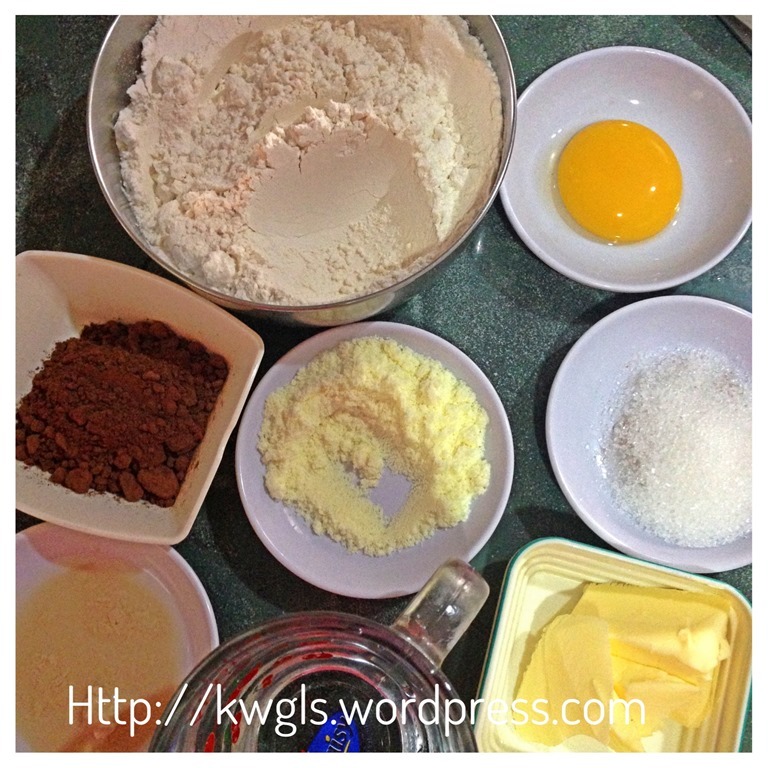 Put all ingredients (except butter) in a big mixing bowl, stir using a spoon until a sticky dough is form. Change to a stand mixing bowl, use the dough hook to knead the dough at low speed for about 15 minutes, add butter and increase the speed until high. Knead for another 15 minutes until the dough is smooth and leaves the sides of the mixing bowl. Take out the dough and lightly knead in a flat surface dusted with some bread flour. 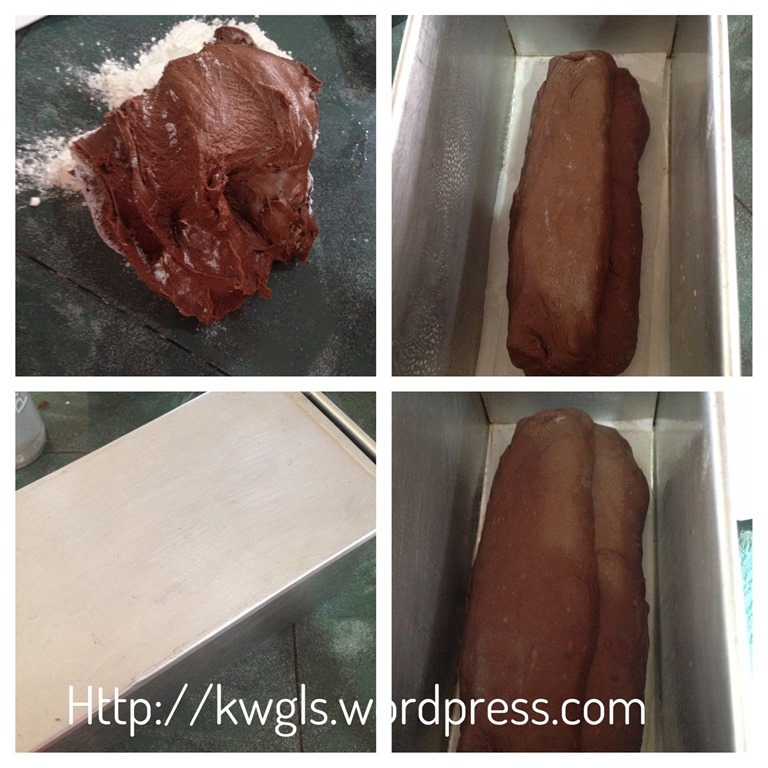 Shape the dough into a loaf shape and transfer into the Pullman tin. Let it proof for about 1/2 hour or until it double in size whichever is earlier. (Note that I did not do second proofing but if you prefer, you can let it proof for the first time until double in size, punch, knead and shape the dough into the loaf tin and let it have a second proofing for about another 15-20 minutes. In this way, there will be no embarrassing holes in your bread portion). 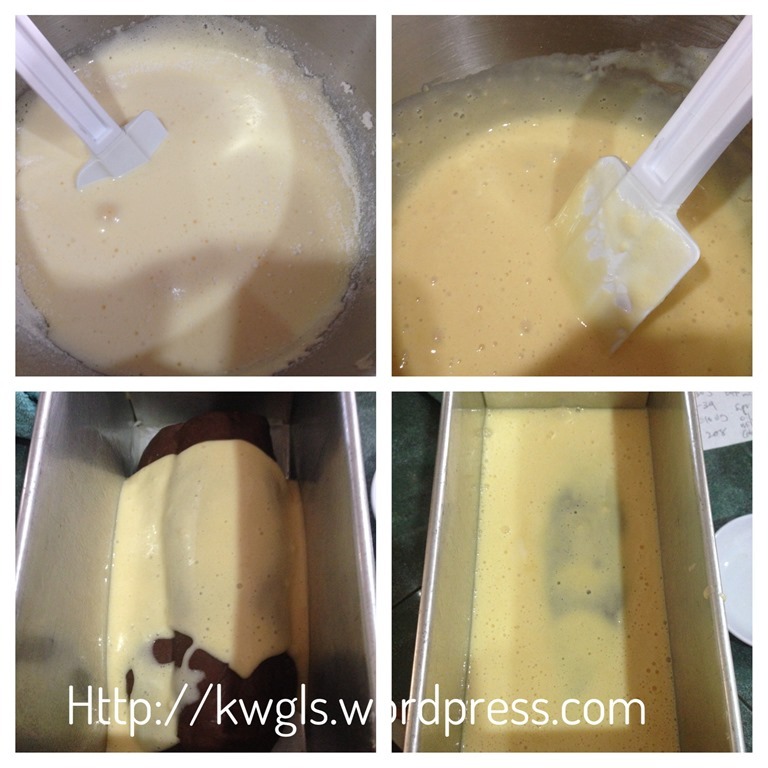 Please scroll down to see an updated post of making cake portion via egg separation method. 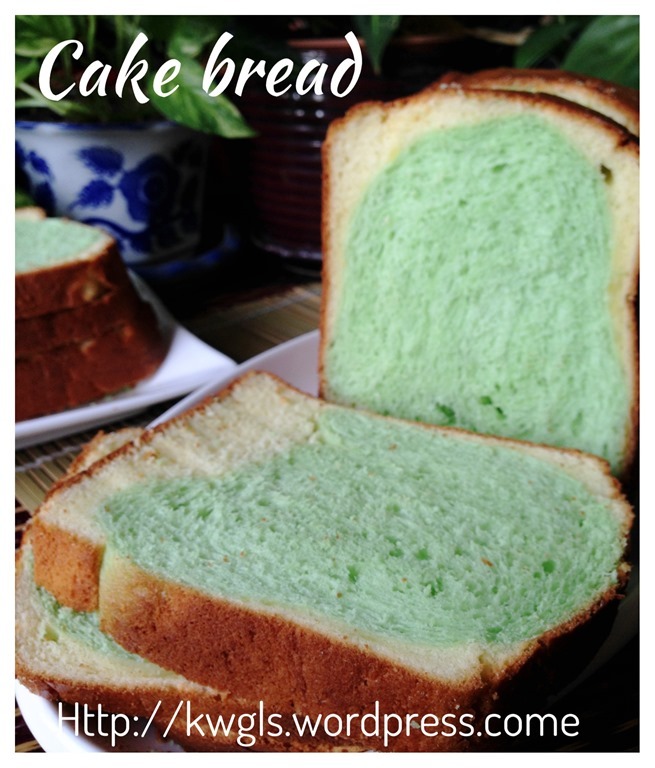 Alternatively, you can use this sponge cake method. Just before the dough is almost done, beat the egg in the stand mixer until bubbly. Add sugar gradually spoon by spoon. Increase the speed until high and beat until the volume expand about twice. Add the corn oil gradually and let it beat until combined (about 1 minute). 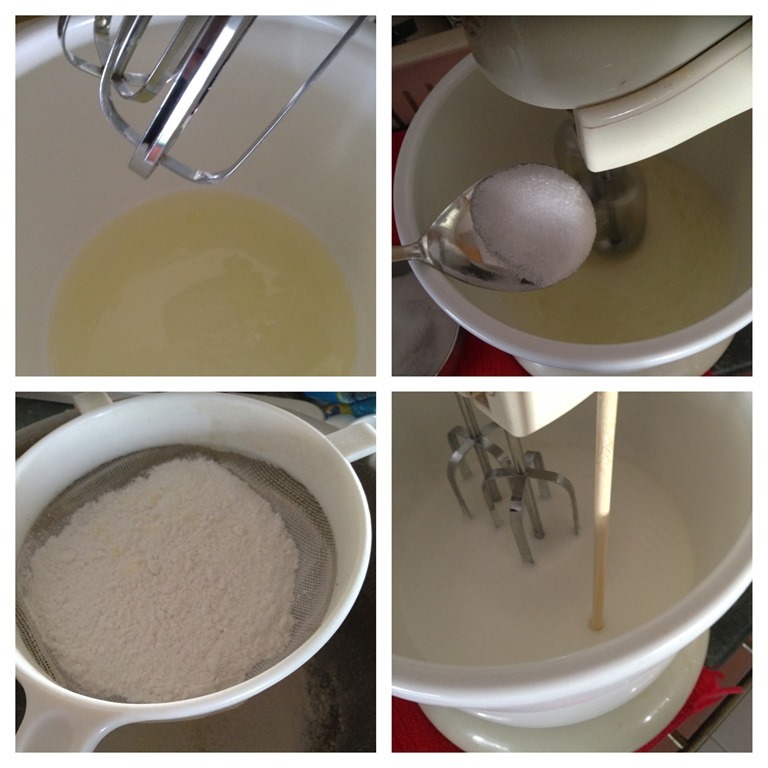 Sift in the cake flour and milk powder into the batter. Preheat the oven to 170 degree Celsius . 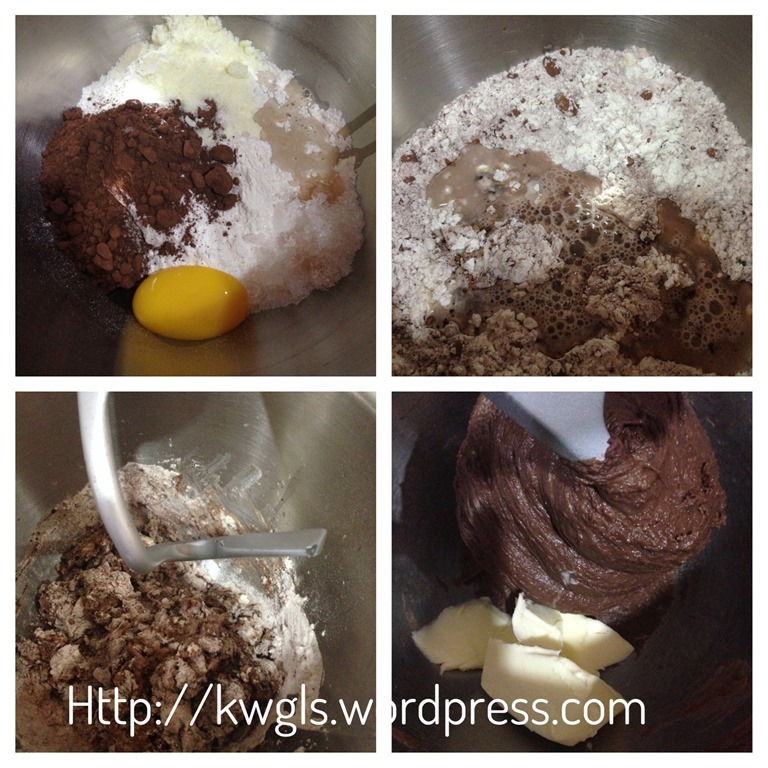 Quickly use a spatula to fold in the flour until well mixed. Pour the cake batter over the proofed bread. Baked in the oven at 170 degree Celsius for 45 minutes. 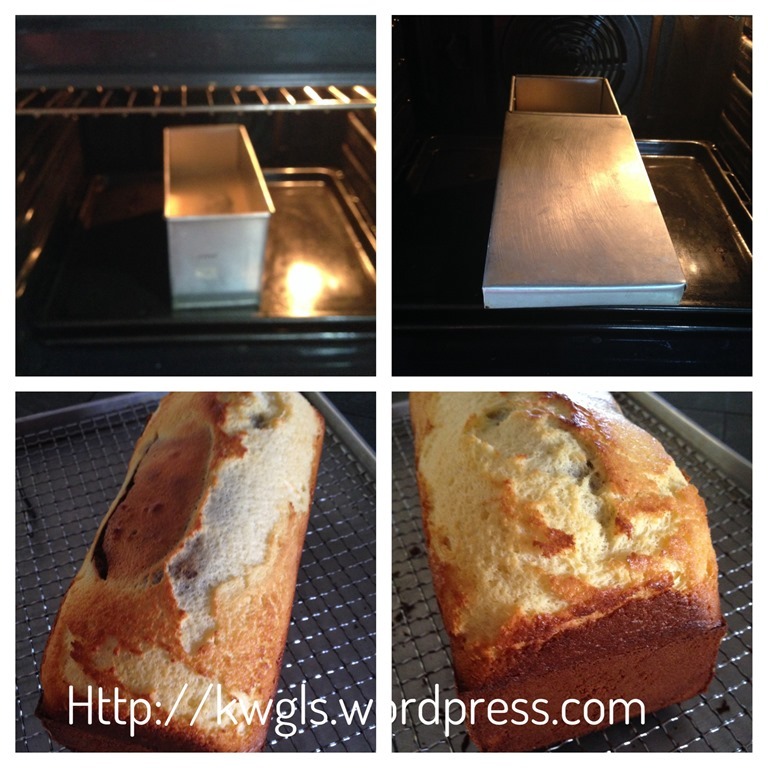 After 25 minutes, slide in the Pullman tin cover to prevent the cake bread from getting burnt. After 45 minutes, perform the skewer test by inserting a skewer into the middle of the cake bread and ensure that it comes out clean. Today, I have decided to prepare this as breakfast. 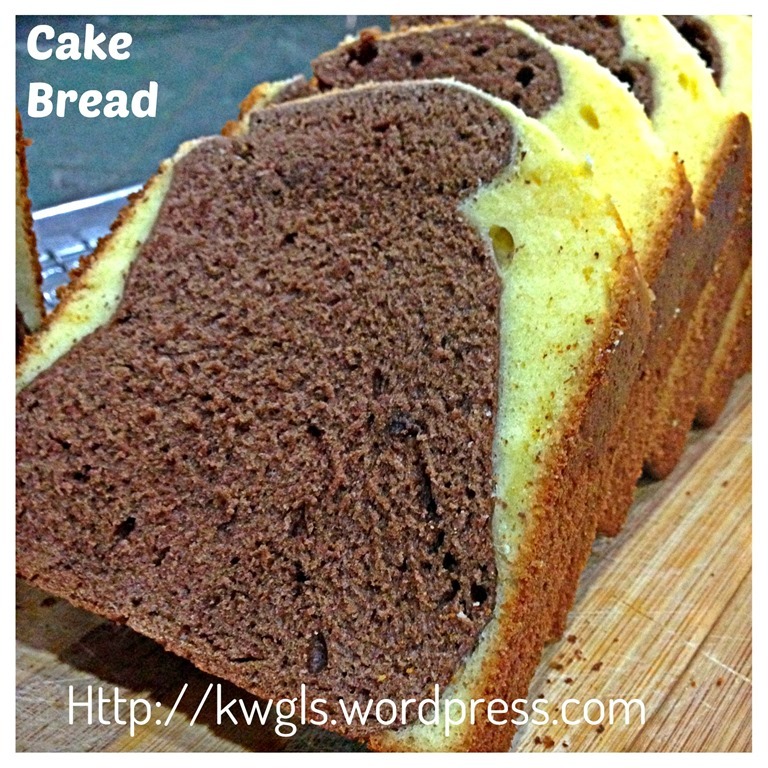 I have done minor modifications to the preparation and instead of normal sponge cake preparation method, I have used chiffon cake method by using egg separation method. Texture wise, it is slightly better than the above. Since I am running out of eggs, I have used 4 eggs instead, as such the cake portion is slightly less. 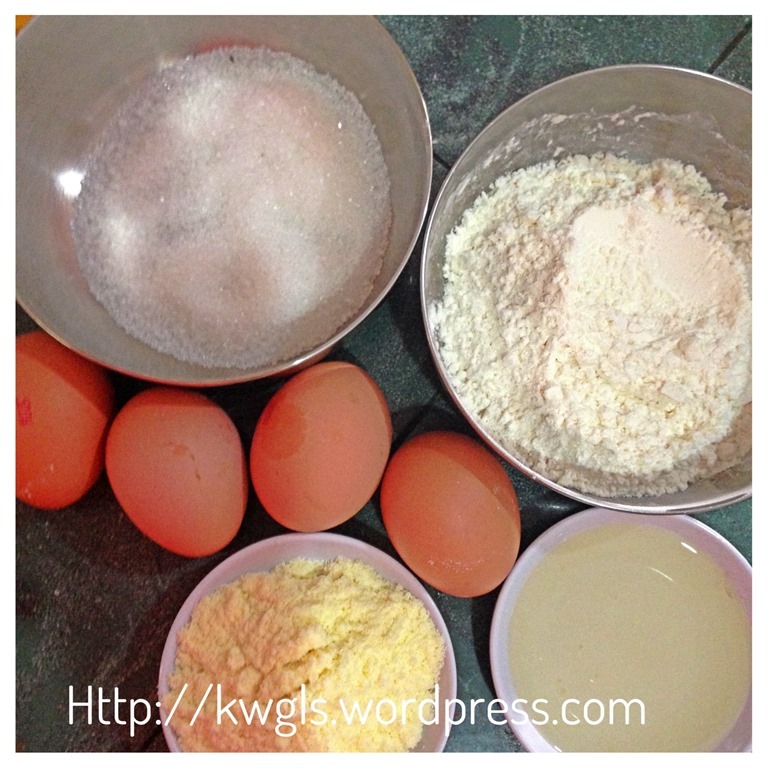 Therefore, it is advisable that reader follow the above recipe and use egg separation method instead. 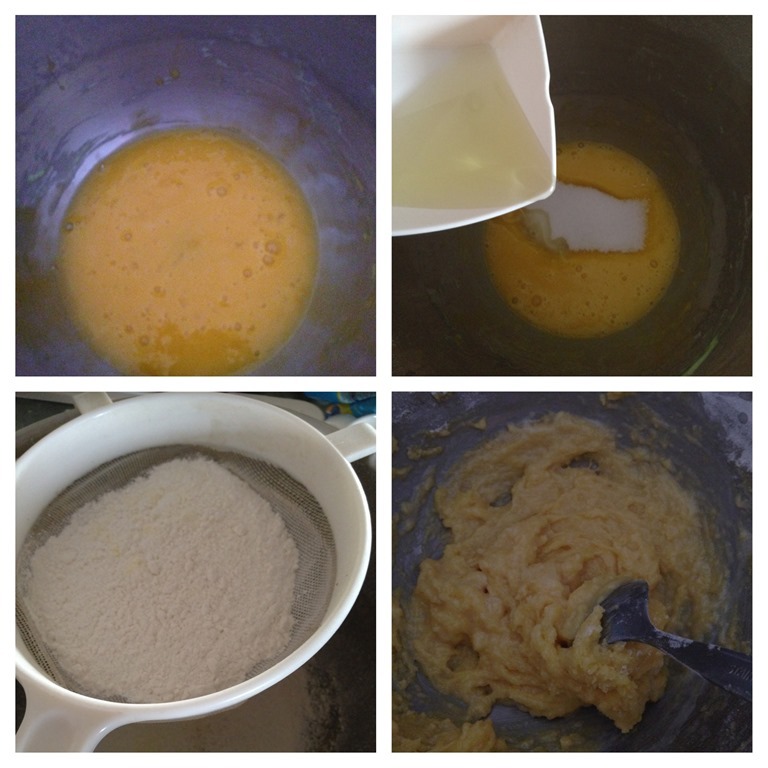 However, to save some time, you can by ready sponge cake pre-mix, prepare in accordance with the packaging instructions and pour on the bread dough. Segregate egg whites and egg yolks. 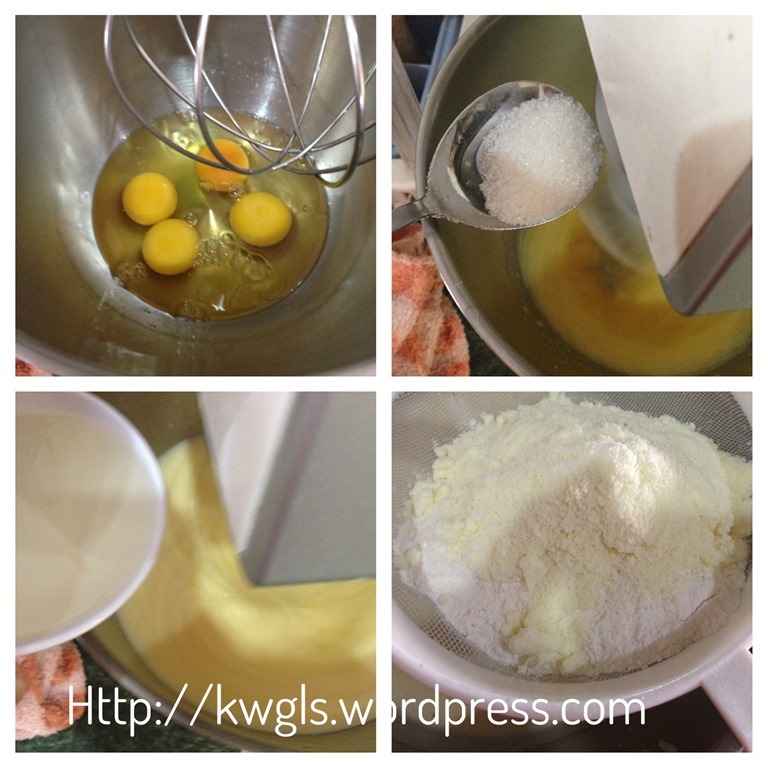 For the yolk portion, whisk the egg yolk until fluffy, add 1/2 of the sugar and cooking oil, stir until well combined. Sift in the cake flour and milk powder. Set aside for later use. Beat the egg white until soft peak, add the remaining sugar until firm peak. Pour one third of the egg white to the yolk batter, fold until well mixed. 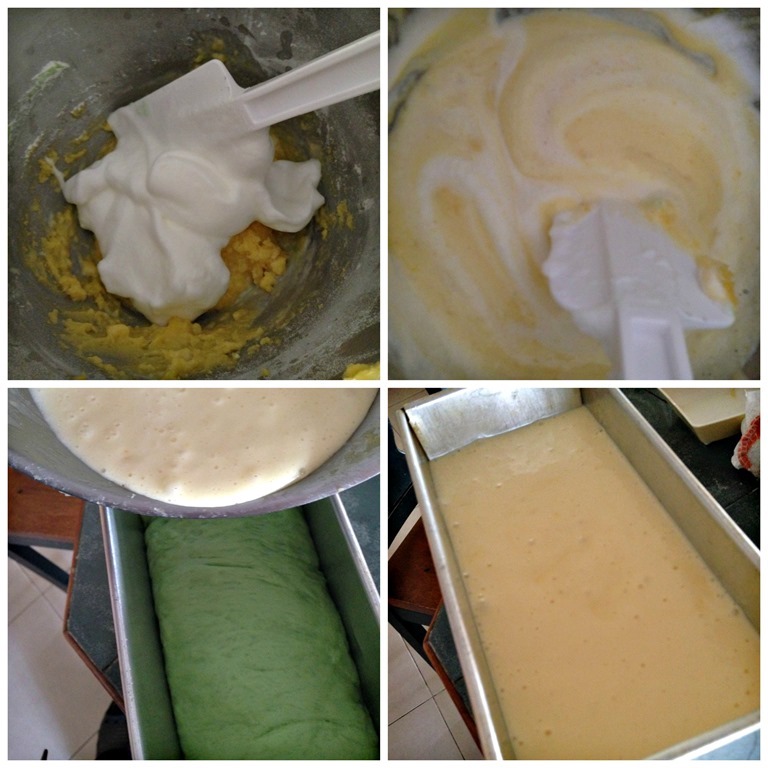 Pour the mixed batter to the remaining 2/3 of egg whites, fold until well mix and pour the cake batter into the tin. 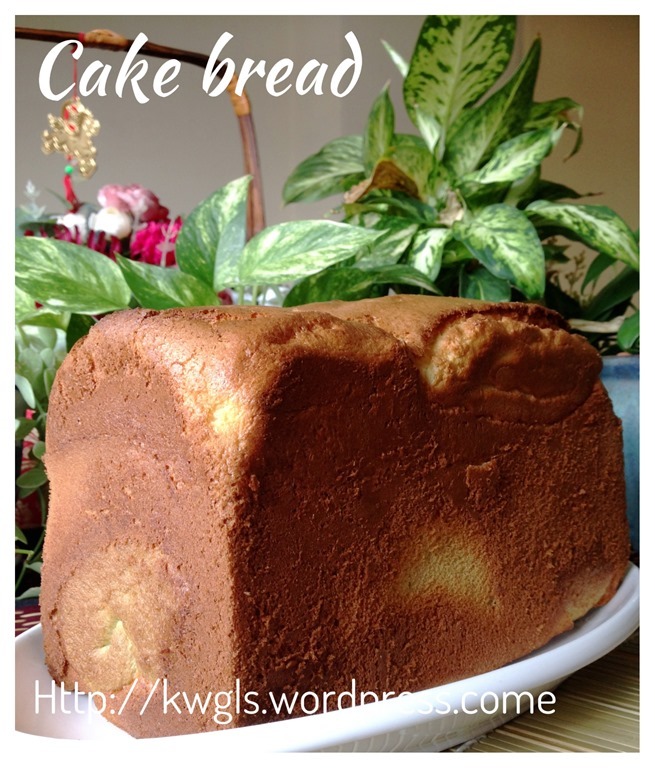 Not a very difficult bake but patience is required to do the cake bread. 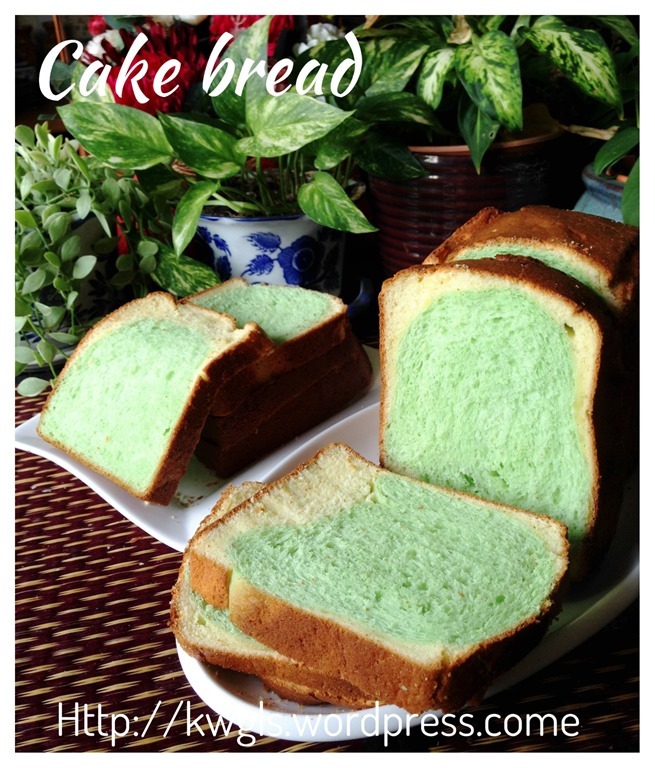 Be it cake bread or bread cake is up to you, ha-ha. 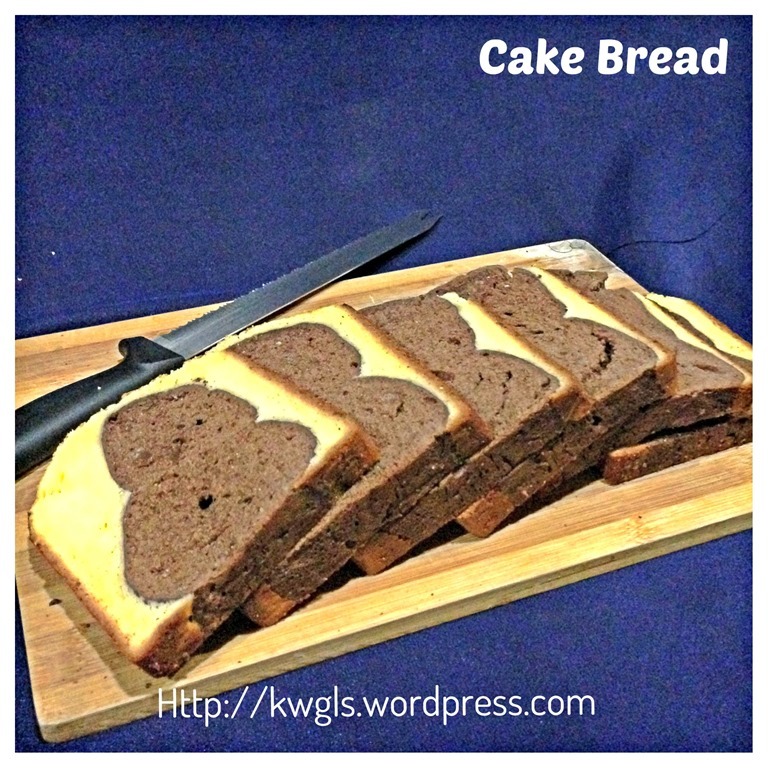 I have decided to use cake bread since bread portion is more than my cake portion. I especially the overall texture of this special bread. 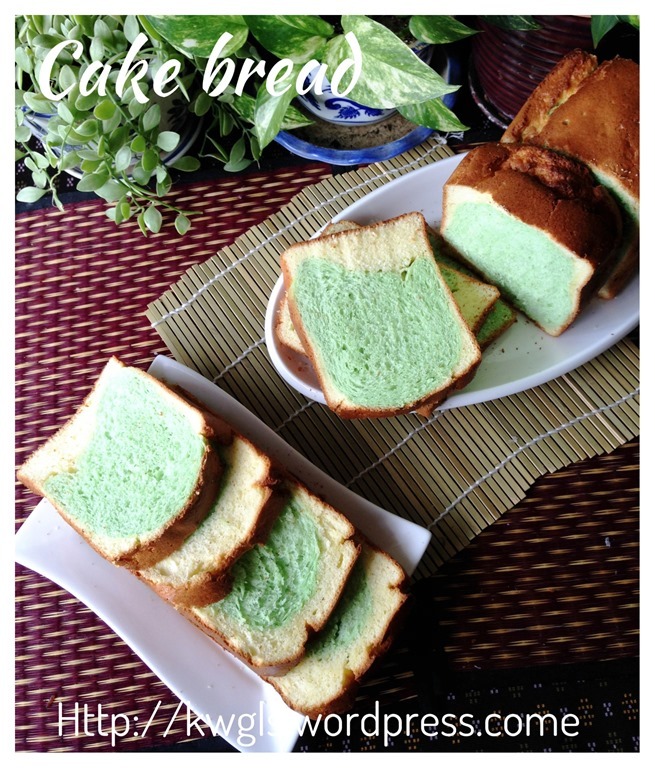 Lastly, thanks Ms Adeline Sim for her generous in sharing the recipe. Remember, as the recipe is adjusted to have 6 eggs, therefore your cake portion will be much bigger than mine. To avoid embarrassing holes trapped inside the bread, please do second proofing of bread if times permit. 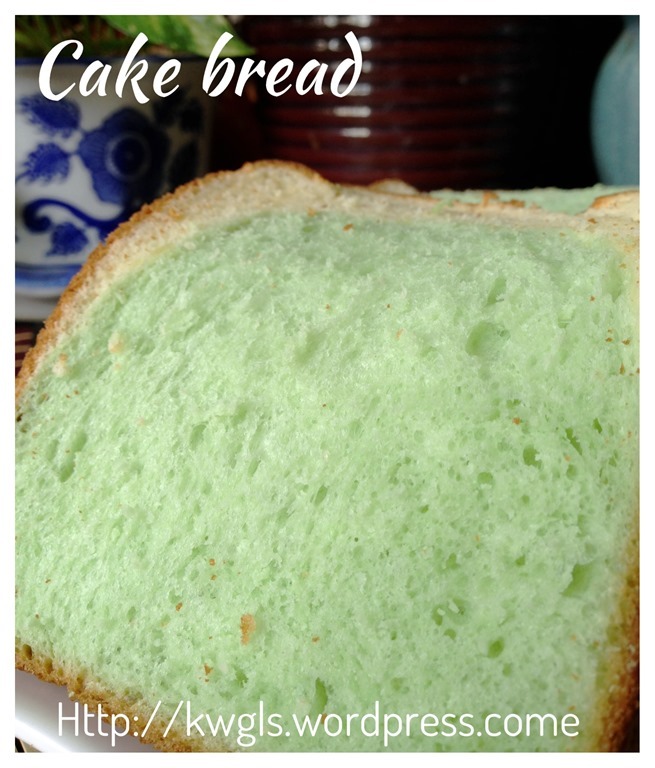 This entry was posted in Breads and Pizza, Cakes and cookies, Food Preparation Series and tagged 8, bread cake, Cake bread, 蛋糕面包，面包蛋糕， postaday, GUAI SHU SHU, Guaishushu, kenneth goh. Bookmark the permalink. Hi! I tried this recipe and got so much cake batter leftover! I think I might have over beaten the eggs till too fluffy! Also your cake ingredients states 45g of fresh milk but your instructions said milk powder? I always think fresh milk is the liquid milk and not powdered milk. Jeannie, thanks for trying. I am sorry to have confused you. It should be milk powder instead of fresh milk. I have amended it to milk powder and thanks for highlighting.. I deeply apologize for this. The overflow can also be due to the proofing of bread. Over beating is another possibility. But it wouldn’t spoil your bakes. Once again, I sincerely apologize. This sounds great! Thanks for linking up to SNF! Are u able to advise me if the cake batter is poured on top the proofed bread dough, will the bread dough collapse and resulted in failed bread? You see I’ve aways baked my bread successfully after bread dough was proofed and rose to a height, I proceed to put it into oven and bake. 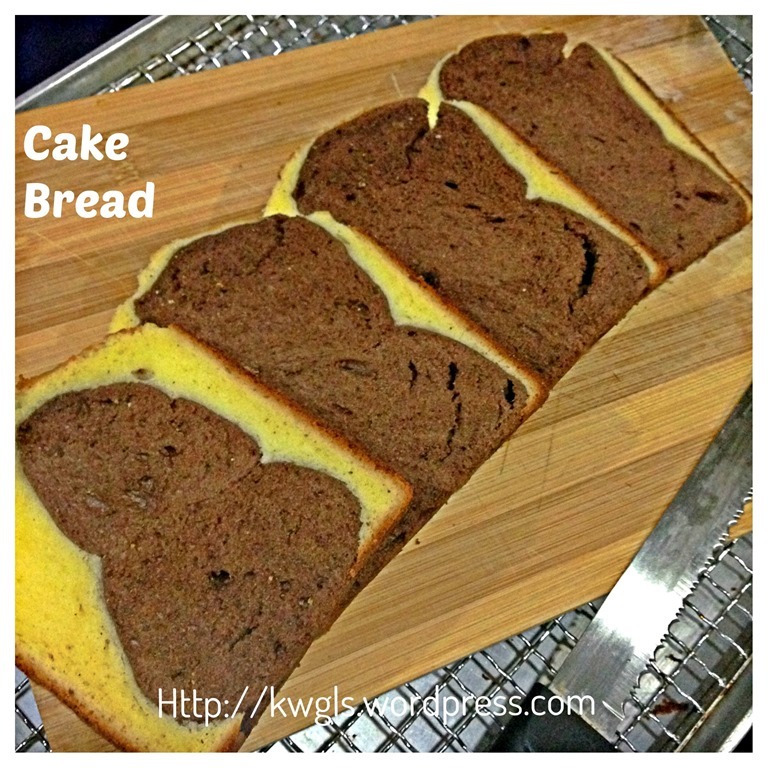 But since for cake bread, the cake mixture is poured over the bread dough and such is the case, the bread will certainly collapse and I was afraid the bread portion will not turn out soft and chewy bread anymore. Can I just use fresh milk instead of milk powder. 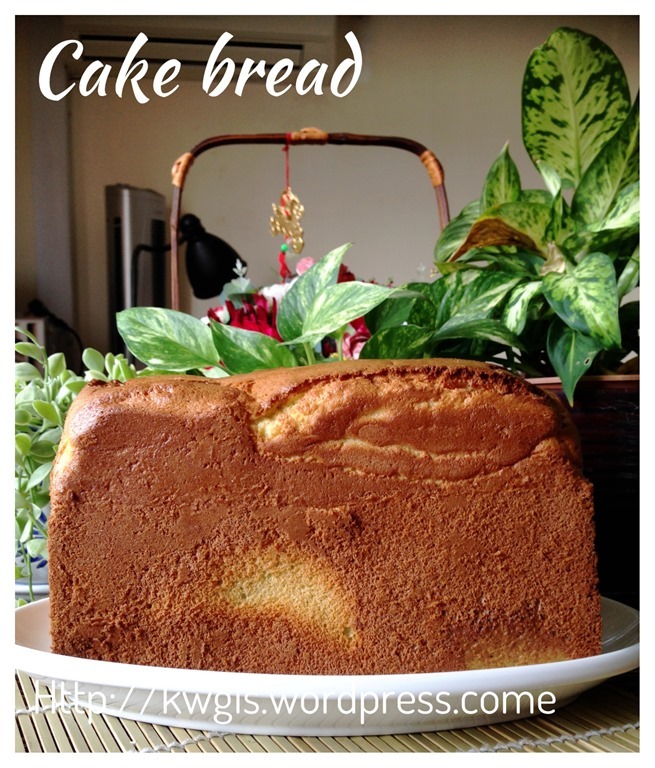 Can i use bread machine to bake cakebread? I do not have bread machine and I am totally unsure.